You’ve probably heard of Bitcoin, the trendy crypto-currency used increasingly by techies and cyber criminals from here to Russia. If you’re not yet aware of what a crypto-currency is, then check out the Wikipedia article here. Before Bitcoin barely even gets a glimpse of the mainstream, there is a new currency on the scene. It’s called Doge coin (pronounced ‘dog coin’. I think. ), and it’s already a serious contender in the crypto-currency market, with the trading of Doge Coin exceeding that of Bitcoin in January 2014. Considering that it was only launched in December 2013, that is an astounding level of growth. What’s different about Doge Coin? That’s a very good question. We have loads of payment methods already. What can Doge Coin offer us that we can’t already do with, say, Paypal? Well, for starters most payment methods charge a fee. Paypal for example can charge over 3.4% to receive a payment. Doge Coin is free to send and receive payments, and it couldn’t be easier. Just enter someone’s ID, along with how many coins you’d like to send and you’re done. No account limits, no silly security restrictions. But can’t Bitcoin do that? featured on Tumblr and Reddit. The cute dog used to promote currency is often used in internet memes and jokes. The currency has rapidly gained acceptance from the social media community, thanks to the lovable canine mascot and it’s cute ‘much coin’, ‘wow’, ‘many pay’ style catch phrases. As well as the cutesy marketing, Doge Coin also has another trick up it’s sleeve. 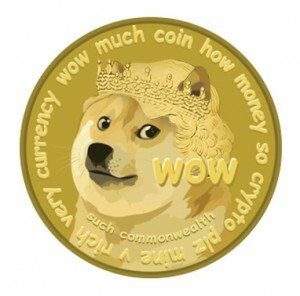 Whether intentional, or just a fluke, the low value of each Doge Coin means that you can make the grand gesture of sending someone 1,000 Doge Coins and it will barely cost you 1USD. Compare this to the sending a single Bitcoin to your friend which would cost you over 700USD, it’s clear to see that there is a psychological difference in value between the two. This is probably why there has been such a huge rise in transactions of Doge Coin. People are throwing them around left right and center. A few hundred here, a couple of thousand there and you’ve barely broke a fiver. 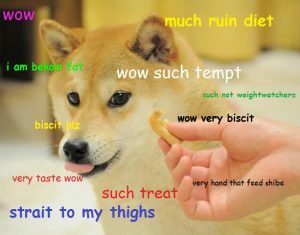 Should I invest in Doge Coin and get rich? That’s the million dollar question! In hindsight, with Bitcoin the answer would have been a resounding YES! But for every success, there are a hundred failures that nobody ever hears about. Did you know that there are currently at least 93 crypto-currencies? Which one do you invest in? Well, not one of them have seen the explosive growth of Doge Coin. My money’s on the dog. This fascinating video by the RSA explores the various motivators which drive technical people. Contrary to popular belief, financial motivator are not always effective and can even have a negative effect on productivity.